to remind them of the Israelites journey of 40 years in the desert. Many Jews build three sided structures in their back yards. The roof is covered with greens or other items but allowing viewing of the stars. Many are fancy structures but just as many are barely held together. The whole family decorates the Sukkah with art and favorite things to make the time in the sukkah pleasant. Many will try and sleep every night and eat all of their meals. Friends both Jewish and Non Jewish are invited over for meals or desserts during the 8 days of this holiday. old New Year cards, posters or what ever YOU find pleasant to look at to make your time in the sukkah pleasant. The trick of course to all of these decorations is how to survive the outside weather and animals. Traditionally teachers and parents have used plastic flowers and fruits to trick squirrels and birds. Or they have used real dried corn, popcorn and berries welcoming our feather and furry friends. Clear contact paper and laminate are used to cover art work and cards to water proof them. HOW ABOUT A NEW IDEA? HARD TO FIND SOMETHING NEW? Use the small craft organizer bags found at the Dollar Store and all craft stores in a variety of small sizes. They come in a variety of small sizes from 1" by 2" and larger. They are ziploc bags so some creativity is needed to hang them with out allowing rain to get in. So stapling is better than hole punching. you can take a little clear drying glue, open the bag and glue a little on the inside. Shake in the confetti and shake out what ever does not stick. Rubber stamped construction paper colored with gel pens or glow in the dark pens. Sukkot themes can be fruit, flowers etc. Israeli and/or American flags. Any size that can fit into a bag but don't forget the cupcake decoration size! With all art work make sure to place something on the front and back as the wind will blow these around. Make a chain or garland. Staple them over hemp, gymp etc in groups and hang from the roof or hang them along a wall. Glow in the dark gymp/lanyard would add to the fun. Hang them in groups but hang them straight down in a line either on a wall or from the roof. Make sure to leave head room. More ideas and pictures coming soon. 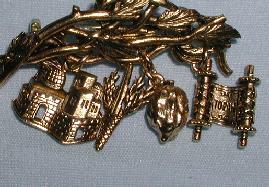 Chadis Crafts For Sukkot Jewelry for sale. 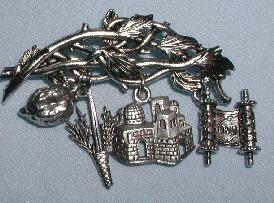 Plus Wine charms, tie bars, stick pins, Book marks,Kippah clips, key chains and more!